Caitlin’s love of horses started at a very young age. Born into the Benjamin family of Kansas City’s historic Benjamin Ranch, she was raised in the rodeo, boarding, and dude ranch business. She pursued her dreams of barrel racing, winning Kansas State High School Barrel Racing Champion in 2005 and went on to compete on a National level. She traveled the country, winning countless buckles, saddles and prize money on multiple horses. After college, she began coaching kids, helping them hone their skills and teaching them how to get in the winner’s circle. At the same time, she began a successful breeding program with several of her champion mares. After her son was born in 2014, she decided to stay closer to home and ease into the real estate business with her mom, Dana Benjamin. 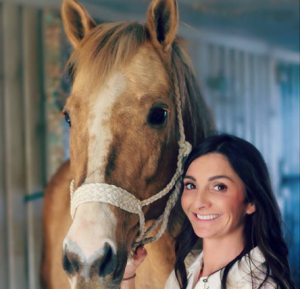 Now, a full-time real estate agent, Caitlin is back in the “winner’s circle,” successfully helping buyers and sellers close on their horse properties. She lives in south Kansas City on a 300-acre family farm and works both sides of the state line. If you’re looking for a diligent, hard-working, relationship-oriented and knowledgeable realtor, contact Caitlin and let her go to work for you.